Q: What makes The Great Frame Up different? The Great Frame Up is a community-based store specializing in the art of picture framing with all work done on site at the location you shop at. This includes design, cutting materials, final assembly and personal service and attention. Your artwork never leaves the premises of your store. Each member of our design team is knowledgeable in every stage of the picture framing process, many of whom are "certified picture framers" thus, allowing each step to be handled properly and professionally. In most cases, your order is taken from start to finish by the same person you consulted with on your design, and after all the time and thought invested in crafting the perfect selection, we are as excited as you are to see the final outcome. In a way, we adopt your artwork for a short period of time and are as proud of the results as you are. Just ask a stranger in the store what they think. Our only job is to make sure you receive all the help, knowledge and advice you need to take home the best finished art project possible, completed exactly the way you want it. A: After you have designed your project with the help of our design team from a choice of 100’s of combination of frames and mat treatments the process of putting a frame together usually take under 45 minutes then it is ready to take home and hang. Q: What are some of the trends in art and framing? A: There has been an incredible amount of focus directed towards family and the home in recent months. Many of us are spending an increased amount of time in the home and, as a result, we are customizing our surroundings to reflect and to influence our total living experience. Comfort, warmth, style and peace of mind are much of what we are trying to achieve both in our lives and in our homes. Colors, fabrics, artwork, furniture, lighting, photographs, all of these accents around the home have an incredible influence on our daily lives. We, as professional picture framers, are seeing many specific trends in the artwork and memorabilia being framed, the colors and textures being used in matting and framing, and the desire to frame these items with the highest quality and preservation techniques available resulting in some very incredible combinations that are making stunning additions to the walls of our very cherished living spaces. After all, our walls are just as important as our floors, they deserve custom furniture as well. Q: What determines the cost of a picture frame? A: The cost of framing varies depending on the size of the picture and the type of materials you select. 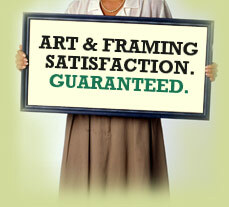 The Great Frame Up offers a wide variety of frames, mats and glass from which to choose. The price is also dependent on whether or not you select Custom or Do-It-Yourself service. Or whether your piece warrants conservation or museum quality framing. When you bring your artwork into our stores, we will gladly help design the most appropriate framing treatment to suit both your artwork and your budget. A surge in framing family photos, family heirlooms, wedding photos, and classic black and white or sepia photography of the stages of your children’s lives or the beginning of yours. Simplicity driving color choices, views on texture and the style of framing, but without sacrificing quality. Matting and moulding with a feeling of nature and natural raw materials and carrying the rich texture of a room onto its walls. A subtle return to traditional and royal colors such as reds, golds, blues, purples, greens and browns. Q: Beyond artwork, what other kinds of things are suitable for framing? A: Just about anything can be framed and cherished. 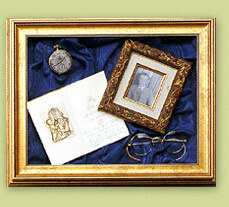 Beyond flat works of art and photographs, The Great Frame Up specializes in creating unique shadow boxes to capture and keep your memorabilia for a life time…from a wedding dress that was in the attic to jewelry your grandmother gave you to a collection of silverware past down from generation to generation. How do you start? First, gather everything that you feel should go into a shadow box. You may think some items wouldn’t work in a frame treatment, but they could add a very special touch. Bring all your items into our stores and let the designing begin. This is a hands on, personal experience and you will be surprised at what can be framed and the wonderful results that you can look at forever.